ItemA-05949 - Vancouver; Skidding Logs On Present-Day Ninth Avenue. ItemA-05950 - Vancouver; Installing Streetcar Tracks On Powell Street. ItemA-05951 - Vancouver; Hastings Mill. ItemA-05963 - Four logs used as the first bridge over the Gorge, Victoria Arm. ItemA-05970 - Queen Charlotte Islands; Totems At Cumshewa. ItemA-05972 - Fort Steele Population Outside The Fort Steele Townsite Office. ItemA-05974 - Texas Bar At Andrew Onderdonk's Camp Near Yale. Item A-05963 - Four logs used as the first bridge over the Gorge, Victoria Arm. 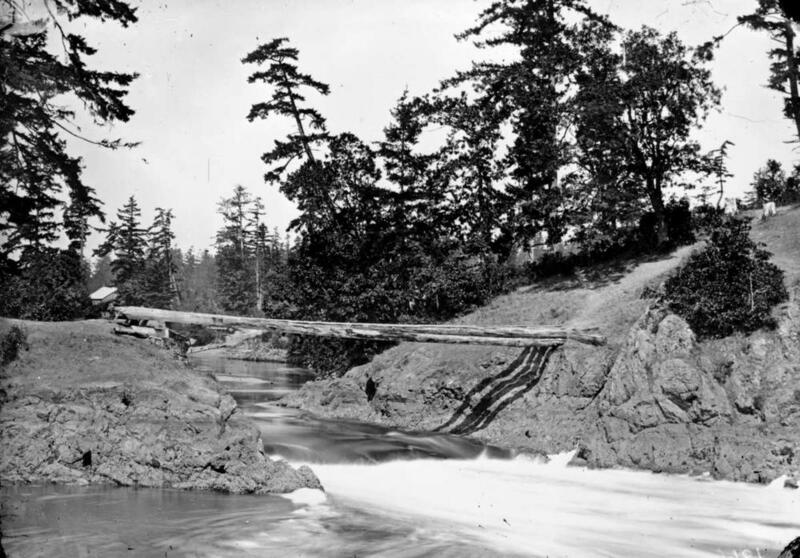 Four logs used as the first bridge over the Gorge, Victoria Arm. Restriction: image HP12018 is a glass plate negative. Researchers should consult the online reference image or reference room copy prior to consulting the original.